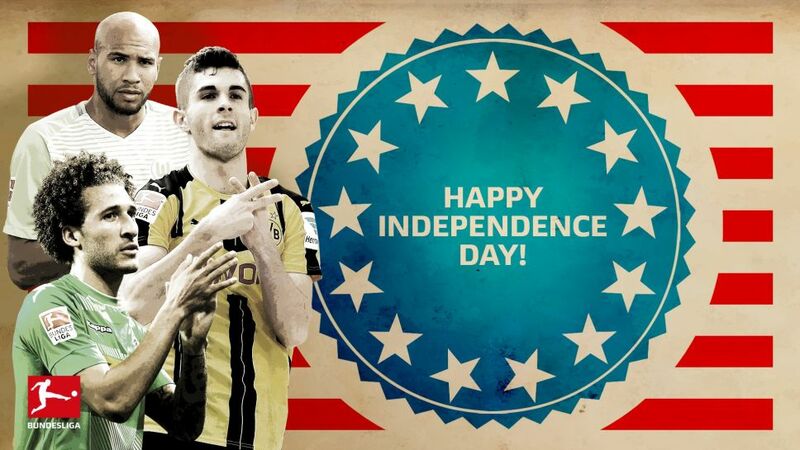 Fabian Johnson (l.), Christian Pulisic (2nd l.), John Anthony Brooks (2nd r.) and Bobby Wood (r.) are four of the Bundesliga's most recognisable Americans. The star-spangled Bundesliga has long had fans on both sides of the Atlantic hooked, and that shows no sign of waning with an exciting handful of USMNT players proudly flying the stars and stripes in Germany. Click right here for the Bundesliga's summer transfer overview! In honour of America's Independence Day celebrations, we take a look at the current crop of transatlantic recruits making waves in Germany. Having burst onto the scene as a fresh-faced 17-year-old in January 2016, Christian Pulisic has gone from strength to strength at Borussia Dortmund. He became the youngest-ever foreign scorer in Germany's top flight, as well as the youngest player to score twice in a whirlwind first few months in the Bundesliga. He went on to underline his credentials as a player at home at the highest level with an impressive first full professional campaign in 2016/17 that culminated in him lifting his first piece of silverware when Dortmund won the DFB Cup. In BVB squad overflowing with attacking talent, Pulisic nevertheless made 29 league appearances, starting 15 times, as well as contributing three goals and eight assists. Now very much a household name in his homeland, the level-headed teenager has developed into the chief attacking threat in the USMNT and is often given free reign to roam - doing so to devastating effect in 2018 FIFA World Cup qualifying to help steer the USA back on course. Famed for his outstanding defensive abilities, John Brooks cemented his place as a Hertha Berlin stalwart in 2015/16 and then further enhanced his reputation with a series of impressive displays at the Copa America in 2016. The imposing 24-year-old centre-back was as solid as ever in the Bundesliga last season, helping the capital club qualify for the UEFA Europa League by virtue of a sixth-placed finish. That was enough to persuade league rivals Wolfsburg to make him the most expensive American player in history by taking him to the Volkswagen Arena this summer, where he will hope to help the Wolves return to former glory. Having scored 17 goals in Bundesliga 2 in 2015/16, Bobby Wood made the step up to the top flight last season by joining Hamburg and immediately showed he has what it takes to shine. The Hawaii-born forward scored twice in the club's first two games, and although he would only find the net three more times over the remainder of the season, his movement, power and commitment won over fans and team-mates alike. Those very same qualities have kept him in the USMNT reckoning in the Arena era, and he featured in both of the team's most recent World Cup qualifiers. Having married this summer and signed a long-term contract extension at HSV, the prospect of a more settled-than-ever Wood will be one both club and country are relishing. The 2016/17 season did not go entirely as planned for Fabian Johnson. The 29-year-old missed a string of games with a persistent muscle injury, restricting him to just 21 Bundesliga outings over the course of the campaign. However, he invariably started for Borussia Mönchengladbach when fit, with his pace, positional awareness and composure on the ball allowing him to play in several roles, ranging from full-back to attacking midfielder. Johnson managed to score three league goals last term, as well as contributing a couple of assists. On a personal level, 2017 has already been a good year for the Munich native: he became a father for the first time and in May he signed a new contract at the club, keeping him at the Foals until 2020. A favourite of former USA coach Jürgen Klinsmann, he has remained a mainstay in the squad under new boss Bruce Arena. While the aforementioned quartet may be the most prominent members of the Bundesliga's current American contingent, there are plenty of others too. For example, Eintracht Frankfurt's Timothy Chandler and Werder Bremen's Aron Johannsson have both played for the senior USA team, but have struggled with injuries of late. And there are a sprinkling of youngsters waiting in the wings too. Schalke recently promoted youngsters Haji Wright and Weston McKennie to the first team squad , while Bundesliga 2 side Darmstadt 98 signed promising young attacker Orrin McKinze Gaines from Wolfsburg in June. Much has obviously changed since Thomas Dooley became the first American-born footballer to play for a top-level German club and later the only U.S. representative to win the Bundesliga (in 1990/91 with 1. FC Kaiserslautern). Yet with Johnson, Pulisic, Brooks and Co. now blazing their own trails, there are undoubtedly more success stories to come.